Light: Bright light, but no direct sun which can scorch the leaves. Thrives under fluorescent light. Water: Keep soil evenly moist at all times, but be careful not to overwater because the rhizomes are prone to rot in soggy soil. Avoid getting water on leaves because they may spot. Humidity: High humidity. Increase humidity by standing pot on a tray of wet pebbles, or use a room humidifier. Do not mist because this can cause spots to form on leaves. Soil: African violet potting mix works well. Propagation: Take leaf cuttings in spring or summer. Cut a healthy, medium-sized leaf with 1-2 in (2.5-5 cm) stem. Poke stem at a 45° angle in moist half-and-half mixture of peat moss and perlite. Enclose the whole thing in a plastic bag to hold in humidity. Keep the cutting in a warm spot (75-80°/24-27°) in indirect light. Leaf cuttings usually root in about 3-4 weeks, but it takes about another 4 weeks for plantlets to form. Pot up each plantlet when it has 3 leaves, and cut away the parent leaf. Provide a humid environment for the Rex begonia. To increase the humidity around the Rex begonia, fill a tray with pebbles and set the planting container on top of the pebbles. Add water to the tray of pebbles, but don't allow it to touch the bottom of the planting container. Place the Rex begonia in an area with plenty of air circulation. Use a good-quality African violet potting mixture, and a container with good drainage holes in the bottom. Keep the plant clean. Pinch off any dead or yellowing leaves, and don't let debris gather on the surface of the container. Water the Rex begonia whenever the top of the soil feels slightly dry to the touch. Water until the soil is moist, but don't water excessively, as Rex begonia is susceptible to rot if the soil is too wet. 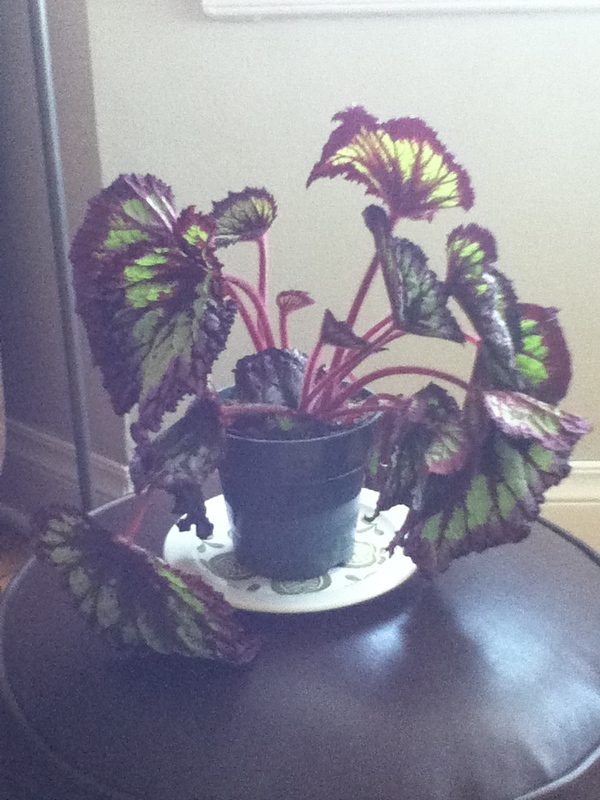 Water on the leaves will cause spots, so don't mist Rex begonia, and don't allow water to splash on the leaves. Maintain the room temperature at around 70 degrees Fahrenheit. Rex begonias don't do well in cool temperatures, so don't allow nighttime temperatures to fall below 60 degrees Fahrenheit. Feed the Rex begonia every other week, using a balanced liquid houseplant fertilizer that has been diluted to half strength. Withhold fertilizer during the winter.